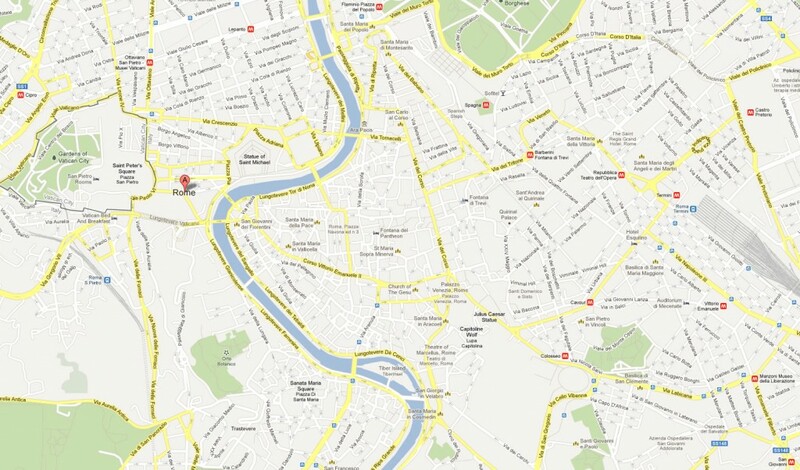 Above is a Google map of much of the most interesting parts of Rome. Rome itself is much bigger than what is shown here, but this map shows you where you will be spending most of your time. In the upper-left, there is Vatican City and the Castle of St. Angelo. After that, much of the other cool stuff is across the river to the right. In the middle, there is the Pantheon, Trevi Fountain, Piazza Navona, Palazzo Venezia, and much more. Towards the top, you’ve got the Spanish steps and the Piazza del Popolo. Towards the bottom, you’ve got the Colosseum, the Roman Forum, tons of ancient ruins, and the Basilica of St. John Lateran. This is a lot to see and it doesn’t even include the museums in Rome! Below, I will break up the sites into four days of sight-seeing and show you what you should do and how you should do it. 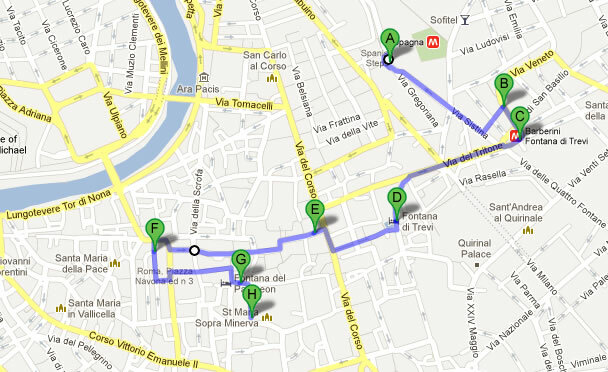 This tour assumes that you are walking, as that is really the easiest way to see the city. First and foremost, you need to see Vatican City and all it has to offer. As the seat of one of the most influential organizations in the world, you need to experience this site. Depending on how you spend your time here, this could take 30 minutes to 5 hours or more. You should also take a tour of the Vatican Museum, which is located immediately North of St. Peter’s Basilica. Remember that this museum is where you will be able to view the Sistine Chapel. After you have soaked-up the miles of halls in the Vatican museum, walk over to the Castle of St. Angelo. Even if you don’t go inside, you will get some really cool photos of this structure. From there, walk across the bridge of St. Angelo, where there are many cool statues of Angels. Then, head up to Piazza del Popolo. There are many cool sites in and around Piazza del Popolo and, once you are finished exploring them, simply head to the Flaminio Piazza del Popolo Metro red line station to get back home. 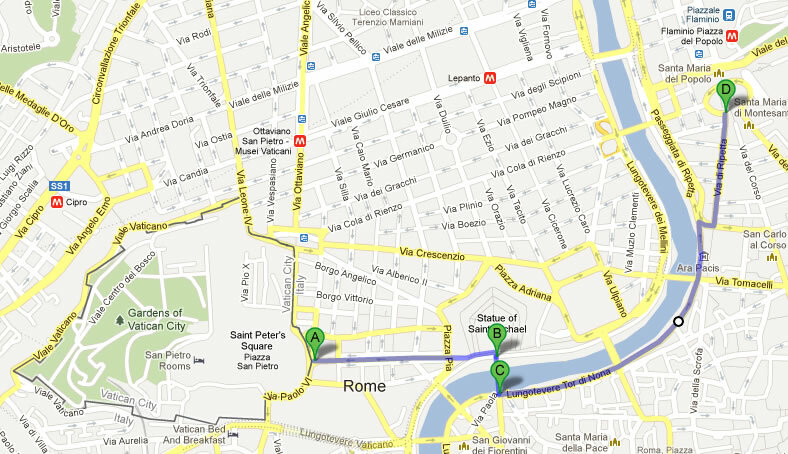 Depending on how much time you spend in Vatican City, this trip can take a couple hours to the entire day. I recommend booking tickets in advance for the Vatican attractions or arriving very early in the morning; otherwise, you will spend hours in lines. Now that you are rested up from Day 1, get ready for some serious walking around. It’s not actually that far, but it certainly looks like a lot. So, we start off at the Spanish Steps. You can take the red Metro line to the Spagna stop and arrive right next to this site. Get here early in the morning or you simply won’t get a decent photo without thousands of people in the way. Once you’ve soaked up the steps and the fountain at the bottom as well as around the top, you have two options, head to B or quickly head to D. If you arrived early in the morning, you might want to skip B and C and head to D – Trevi Fountain. In the morning (before 8 am) there will be almost no one there and you will get amazing photos of this fountain and you can actually enjoy all this amazing structure has to offer without the fear of pick-pockets and cranky tourists. If you skipped B and C, just come back to them at the end of the day. So, let’s head from the Trevi Fountain to the Column of Marcus Aurelius. This is a really cool column that depicts wars of Marcus Aurelius in a spiral relief. This is a quick thing to see, so let’s move along to Piazza Navona. Piazza Navona, is one of the most famous parts of Rome and has three large ornate fountains in the middle of it. This is a nice place to hang out for a bit, grab something to eat and drink and generally enjoy the moment. It will be crowded here, but I’ve found that it is really not that bad. Once you’ve rested up a bit, let’s move on now to the Pantheon. This is a really cool structure and I’m sure you’ve already heard a lot about it. It will be crowded here, but the crowd moves very quickly and it is free to go inside. After visiting the Vatican, this building will seem a bit underwhelming, but it’s still worth a visit. However, no matter your thoughts on the Pantheon, you need to check out the church right next to it. Just behind the Pantheon is the church of St. Maria Sopra Minerva. If you were disappointed with the Pantheon, this will more than make up for it. Though it looks plain and boring from the outside, on the inside it’s another story. Lined with ornate statues, carvings, marble, inset paintings and more, this is the gem that you hoped the Pantheon would be. Though, you should still see the Pantheon. Once you’ve seen the church, it’s up to you to see what you would like for the day. There are many small museums and attractions all over in this area, not to mention all of the old buildings and winding streets. I would recommend slowly making your way back to sites B and C. Get some gelato on the way, refill your water bottle in one of the many public fountains with drinkable water and enjoy the scenery. Once you get to Barberini square, you will see a cool fountain in the center, take your photo and continue to B. B is the Capuchin Crypts. This is a really cool, albeit creepy, thing to see. There are bones from 4,000 monks lining the walls of crypts inside part of a church. The bones are ornately displayed and even made into chandeliers. After the crypts, make your way back to Barberini square, get something to eat, and take the Metro red line home from the Barberini stop. Now that you are exhausted from Day 2, let’s take a slow day. Take the Metro red line to the Colosseo stop. Once you step outside, you will know exactly where to go! Time for a tour of the Colosseum. This was probably one of my favorite sites to visit in Rome and you will certainly enjoy it. After you tour the Colosseum, head up the road to the Roman Forum. This is basically a series of really cool ruins that put you into the streets of Ancient Rome. Also, there is the tomb of Julius Caesar within the Roman Forum; since these are ruins, the tomb is not ornate, but people leave flowers on it every day. Once you’ve had enough of the ruins, continue up the Palatine Hill to view some more ruins. This is a really cool area and you should enjoy it leisurely. You will walk through what used to be a palace and gardens and this is generally a much more relaxing walk than the one you would have had on Day 2. After you have seen enough, walk down the Palatine Hill and you can walk South to see the Circus Maximus (today it’s only a large empty field) and then take the Circo Massimo Metro red line home or just walk North and take the Colosseo Metro red line home. By now, you have seen the biggest and most famous places in Rome. But, now you must see two of the most important. First, arrive at the main train station Termini. 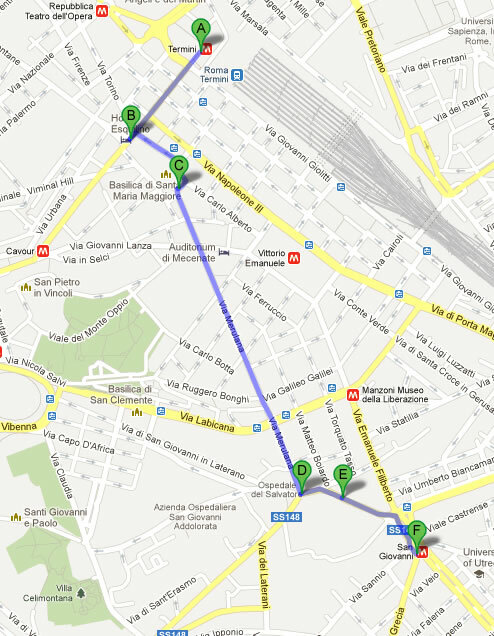 From there, you will walk to B, which is the back of the Basilica di Santa Maria Maggiore. This will give you a very nice photo and view of the steps which lead to nowhere; kind of odd, but it still makes for a nice photo. Then, go to the front of the church and walk in. There is a lot to see here, enjoy. Next, walk down to the basilica of St. John Lateran. It is the seat of the Pope; Rome’s cathedral; and the oldest church in the world. There is no more important church in all the world. After that, the only thing left to do is to visit the steps that Jesus Christ himself reportedly ascended. 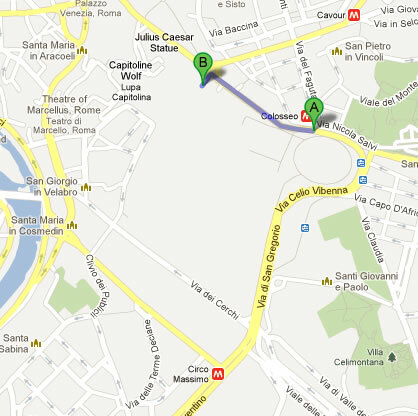 Cross the street and head over to E, the Scala Sancta. You will see a central staircase with people kneeling on each step. If you’re feeling particularly humble, you will say a prayer on each step, kneeling the entire time, until you reach the top step. After this, it’s time to soak those aching knees in a warm bath back at the hotel. Head over to the San Giovanni Metro red line stop and head home. After these four days you will by no means have seen all that Rome has to offer. I mean, there are over 900 churches! However, this guide covers the basics of what any visit to Rome should include. Throughout this website, you will see articles for most of the sites described here. Below are some tips for traveling along the way. Wherever you go in Rome, bring a water bottle and a snack. You are going to be walking a lot and may not always find a place to eat or drink. Particularly annoying is when you want food but arrive at the restaurant during the afternoon ‘break’ when it is closed. Also, note that there are many fountains around Rome that have clean drinking water. This will seem kind of odd at first, but once you start to become really thirsty, it’s amazing. Most of these fountains will look like they are made to provide water to the public, but if you are unsure, just ask someone. However, never scoop water out of the basin of a fountain because that is certainly not clean water. Wow! I hope you are around when I want to tour Rome. I don’t think there could be a better guide. Thanks!